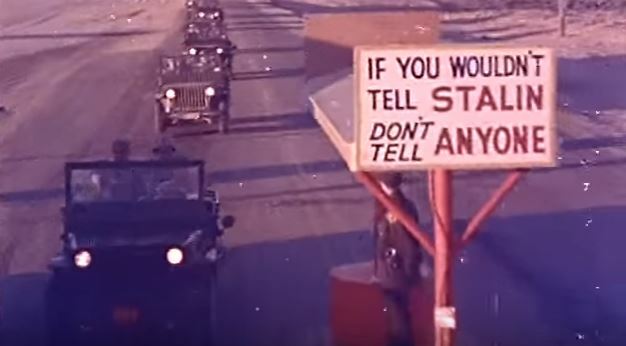 This real colored footage shows active duty military personnel being exposed to radiation from atomic bomb tests at Camp Desert Rock, Nevada Test Site, Nevada. Some of this footage may look familiar, that’s because it was featured in the 1982 documentary/horror film “The Atomic Cafe.” The film was a disturbing collection of government-issued propaganda films that were released in a effort to manipulate Americans into thinking that the atomic bomb was not a threat to their safety. The government conducted a literal “trial by fire”by exposing hundreds of troops to the deadly atomic radiation. Soldiers can be seen standing in foxholes, having their hair blown back by the nuclear shock wave that bombarded their bodies with radiation. The soldiers are then ordered to march directly towards the massive mushroom cloud produced by the bomb, completely unaware of the deadly radiation sweeping over their bodies and the harm it can cause.